Hartley had 14 points (5-9 FG, 2-4 3PT, 2-2 FT) in Wednesday's loss to the Aces. While Hartley reached double-figures for the third straight game, it wasn't enough to prevent the Liberty from suffering their 11th consecutive loss. New York will be back in action Friday night in Seattle. Hartley scored 10 points (3-7 FG, 2-5 3PT, 2-6 FT) off the bench in Tuesday's loss to the Sparks. While the Liberty suffered their 10th straight loss, Hartley was one of the lone bright spots. She reached double-figures for the second consecutive game, while also adding a season-best six rebounds and an assist. Hartley mustered eight points (2-7 FG, 0-1 3Pt, 4-4 FT), five assists and one rebounds during the 96-80 home loss against Seattle on Monday. Despite a four-of-four mark at the free-throw line, Hartley struggled from the floor, shooting just 28.6 percent overall during the loss Monday. Over 28 outings this year, the 26-year-old is averaging 8.5 points, 3.7 assists and 3.0 rebounds per game. Hartley managed two points (0-6 FG, 0-3 3Pt, 2-2 FT), two assists, one rebound and one block in the 97-87 loss against Dallas on Sunday. Hartley failed to convert a field-goal attempt Sunday, going zero-for-six but finished with two points while knocking down both of her free-throw tries. Over 19 contests in 2018, the 26-year-old is posting her best scoring season since her rookie campaign with 8.3 points per outing this year though. Hartley registered four points (2-5 FG, 0-1 FT), three assists, two rebounds and one block in the 80-77 loss at Washington on Thursday. In just under 19 minutes of action, Hartley fouled out and really wasn't much of a factor on the stat sheet during the loss Thursday. The Liberty's point-guard is currently averaging 8.1 points, 3.8 assists and 2.7 rebounds across 14 games this year. Hartley added 18 points (7-13 FG, 4-8 3Pt, 0-2 FT), five assists, three rebounds and two steals during Tuesday's 80-74 loss the the Mercury. This was by far the best game of the 2018 season for Hartley as she managed to reach double figures in scoring for the first time in five games. The former UConn guard is so far averaging a team-leading 4.8 assists per outing this year as well. Hartley mustered eight points (3-10 FG, 1-3 3Pt, 1-2 FT), six assists and three rebounds during Sunday's 80-76 loss at Chicago. Hartley played the most minutes of any Liberty player Sunday and responded by shooting a poor 30 percent from the field. The former UConn standout started 24-of-34 games last year with the Liberty and it figures that she will be the starter for most of 2018, bearing any major injuries or issues. Hartley signed an extension with the Liberty on Friday. Hartley averaged 7.8 points, 2.1 rebounds and 2.1 assists in just over 20 minutes a night in 2017. 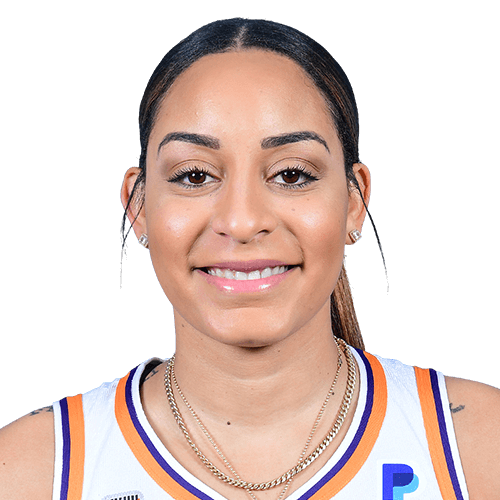 The guard will likely remain in a reserve role during her second year in New York, but after an uptick in her performance over the second half of last season, she could hold a bigger role in this upcoming campaign. Hartley collected 13 points (5-14 FG, 1-5 3Pt, 2-4 FT), three rebounds and two assists across 29 minutes during Tuesday's 81-76 victory over the Fever. Hartley, who's averaging 7.2 points per game on 42.7 percent from the field, has put together a nice stretch of three games, posting 15.3 points per contest on 48.5 percent shooting. Her workload has been relatively up and down most of the year, but the Liberty's coaching staff has given her a consistent workload of 27.6 minutes per game over the past five outings. Not only has Hartley responded with better scoring, she's also averaging 3.6 assists and 2.4 rebounds over that stretch, which both surpass her season averages of 1.8 and 1.9 respectively. All in all, she's likely worth consideration in DFS at this point. Hartley provided 17 points (6-9 FG, 2-4 3Pt, 3-3 FT), five assists, two rebounds and one steal across 29 minutes during Tuesday's 93-81 loss to the Stars. After going just 1-for-7 on Sunday en route to four points, Hartley immediately pounced at the next opportunity to prove herself, dropping a highly efficient 17 points Tuesday. She's seen at least 22 minutes in each of the past six games, which is a fair bump from the 18.7 minutes per game she's averaging on the season as a whole. Over that six-game stretch, she's scored in double-digits four times and collected at least four assists three times. Considering her solid production in her increased role, Hatley certainly seems worth a look as a mid-tier DFS option. Career Transactions : Drafted No. 7 overall by the Seattle Storm in the 2014 WNBA Draft… Traded to the Washington Mystics on April 14, 2014… Traded to the New York Liberty on January 30, 2017 along with center Kia Vaughn in exchange for center Carolyn Swords. Drafted in the 1st round, 7th overall by the Seattle Storm in 2014, and traded to the Washington Mystics on draft day. 2017: Appeared in all 34 games for the Liberty, making 24 starts… Averaged 7.8 ppg, 2.1 rpg and 2.1 apg… Finished the season ranked 22nd in the WNBA shooting .345 from 3-point range… Ranked 2nd on the Liberty with 38 made 3-pointers, the highest tally of her career… Averaged 10.8 ppg and scored in double figures 12 times over the final 17 games of the season, helping lead the Liberty to a 14-3 record over that stretch… Netted 15 points, including 2 3-pointers. Also had 5 assists and 2 rebounds in playoff game against Washington (9/10)…Scored 13 points, including 2 3-point shots. Grabbed 3 rebounds and handed out 2 assists in final regular-season game at Dallas (9/3)… Connected for 11 points, including a 3-point shot. Posted the highest +/- rating with 21 in a win over Chicago (8/27)… Against her former team, scored 10 points including a pair of 3-pointers. Grabbed 4 rebounds and handed out 3 assists in win over the Mystics (8/25)…Collected 12 points and 3 rebounds in road win over Indiana. Also put up 2 assists and 2 steals (8/23)…Dished out a season-high 6 assists. Managed 9 points, including 2 3-pointers, and 4 rebounds in win over Minnesota (8/20)…Hit a season-high 3 3-pointers to finish with 11 points, also posted 3 rebounds against Connecticut (8/18)… Matched a season-high 5 assists. Connected for 7 points in win over Los Angeles (8/13)…Reached 4-straight games in double figures, scoring 10 points with a couple of 3-pointers to go along with 2 assists in a win at Atlanta (8/11)… Managed 13 points to record her 3rd straight game scoring in double figures, her longest streak of the season, and longest such streak since 2014. Also had 3 rebounds and 2 assists against Indiana (8/8)…Scored 16 points, 1 shy of her season-high. Also had 3 rebounds and 3 assists at LA (8/4)…Matched her season-high with 17 points. Recorded a new season-high with 5 assists. Also managed 1 steal and 2 rebounds at San Antonio (8/1)… Matched her season-high with 17 points, going 3-of-3 from deep. Also managed 4 assists and 3 rebounds in win over Indiana (7/28)… Netted 10 points, including a pair of 3-pointers. Also had 3 rebounds against Connecticut (7/19)…Posted a team-high 15 points, including 3 3-pointers, to lead the Liberty in scoring for the 1st time. Was able to also collect 4 rebounds, 1 assist, 1 steal, and 1 block against Washington (7/16)…Finished with 5 points and also tied her career-high with 5 rebounds at Washington (6/29)…Scored double figures in back-to-back games for the 1st time this season. Finished with 13 points, shooting 5-of-7 from the floor. Also had a rebound, assist, and steal against Connecticut (6/23)… Scored a season-high 17 points, including a clutch erratic 3-pointer in OT at Dallas, eclipsing 10 points for the 3rd time over the previous 6 games (6/16)… Tied her season-high in scoring with 10 points, also tallied a season-high 3 steals against Seattle (6/11)…Finished the game with 10 points, a season-high, including a pair of 3-pointers against Dallas; also had 4 assists, 3 rebounds, and a career-best 2 blocks (6/2) …Had 3 assists and 4 rebounds in home opening win over San Antonio Stars (5/13). 2016: Played in 24 games, making 5 starts… Posted 6 games scoring in double figures… Made at least one 3-pointer in 15-of-24 games played, shooting .362 from 3-point range… Scored a season-high 17 points and nailed 4 3-point field goals in the season opener against the Liberty (5/14)… Grabbed a season-high 6 boards against Connecticut (5/21)… Dished out a career-best 7 assists against the Los Angeles Sparks (5/20)… Missed the final 12 games of the season to sit out due to pregnancy. 2015: Played in just 25 games this season…sat out the first six games of the regular season due to a right foot stress fracture…averaged 12.2 minutes per game…averaged 4.2 points per game…dished out 1.6 assists per game. 2014: Started in 29 games out of 34 games played…named to the WNBA All-Rookie team… fourth on the team and fifth amongst rookies in scoring with 9.7 points per game…had a 20-point performance in the Mystics triple overtime win over the Sparks on June 1…scored a new career high 26 points in an overtime loss against Seattle on June 22…averaged 27.1 minutes per game, fifth amongst rookies…dished out 3.1 assists per game, including a career high six assists in a loss to the Lynx on June 20. PRO OVERSEAS: Played for the Mersin BB in the Turkish Basketball Third League… led the team in assists, averaging 4.3 per game and was the third leading scorer… Returned to Mersin BSB to compete in the Turkish League and EuroCup Women tournament for the 2017-18 season… Played for the UNIQA Euroleasing Sopron in the Hungary-A Division in 2014. COLLEGE: Selected to the prestigious 2011-12 WBCA/State Farm All-America Team, Hartley was the 15th Husky all-time and only the fourth UConn sophomore all-time to be honored on the squad… She is seventh on UConn’s charts for most points (533) and assists (140) by a sophomore… Hartley’s stellar sophomore season landed her a spot on the 2011-12 All-BIG EAST First Team and the 2011-12 All-BIG EAST Tournament Team… Entered the 2013-14 season in ninth place on UConn’s all-time 3-point field goals made list with 177 … Scored the fourth most points by a UConn freshman (472) and the 11th Husky all-time to be selected as the BIG EAST Freshman of the Year … Hartley has built a reputation of playing her best in big games and has been selected to the All-BIG EAST Tournament Team in 2011 and 2012, the All-Philadelphia Regional Team in 2011 and the All- NCAA Tournament Team in 2013. Personal: Born September 30, 1992 … Parents are Dennis and Simone Hartley … Majored in communication sciences … Earned a Suffolk County Legislature proclamation for high academic achievement, community service and excellence in basketball… Son, Bryson Noah, born in January 2017.